My understanding is the shuttle was designed as cost-effective workhorse, a space-van to ferry cargo up to the ISS, conduct zero-G experiments and put satellites into orbit. So why didn't NASA take money from the private sector to do these later two on the behalf of corporations? Or even restock the ISS on the behalf of other government organizations such as ESA and RFSA? I don't feel the public would have objected, if all the money had all gone on future space exploration. Maybe NASA could even have become a self-sustaining government organization, shutting up all nay sayers who think space exploration is a waste of taxes. Or was the space shuttle program a huge financial failure, considering Russia scrapped their shuttles, the ISS gets restocked by capsules launched by traditional staged rockets (Soyuz and Falcon 9?) and private companies launch their new satellites with staged rockets? So why didn't NASA take money from the private sector to do these later two on the behalf of corporations? NASA did take money from the private sector to do these things. The STS-5, STS-7, STS-8, STS-41-B, STS-41-D, STS-51-A, STS-51-D, STS-51-G, STS-51-I, STS-61-B, and STS-61-C Space Shuttle missions all launched comsats for paying customers. The original plan, ridiculous as it was in hindsight, was for STS to be the sole US launcher of all payloads. The first 4 missions were test flights, so omitting them, you can see that 11 of the 21 "operational" missions before the policy change carried commercial satellite payloads, often multiple, up to 3 comsats per mission. A total of 18 commercial satellites were deployed from the Shuttle. Commercial payloads were very important. Coke and Pepsi even paid to fly their products on STS for promotional purposes. Now, did the planned economics make sense? Almost certainly never. Cost projections were based on unrealistic flight rates so the efficiencies of scale were never going to happen. The Space Shuttle was designed to be inexpensive, but in the first launch, it was actually found to be quite a bit more expensive than it was thought. The shuttle was supposed to take only a week or two to turn around, in which case it would have been a very effective launch vehicle. Instead, the tiles ended up needing replacing after every flight, which ended up taking months, instead of a week. If you can't launch the Shuttle very often, then the cost goes up enormously. As it stands, the cost to launch the Shuttle was about $450 million per mission, far higher than even the most expensive rocket today. Post-Challenger, there were additional restrictions on what items the Shuttle could carry into space. This became an issue for the Galileo mission, for instance, that originally intended to have another stage on board, that was removed because of potential issues. There are many material limitations on what the Shuttle would carry, due to it's requirement to protect the humans on board. Also, the cost of life of an Astronaut had to be considered any time the Shuttle was launched. As for the zero g experiments, NASA was willing to host some of those, with the request that the science all be returned to the public. Feel free to take a look at the partners that NASA had with the shuttle experiments. In the early days of the Shuttle, as @OrganicMarble mentioned, NASA did launch some commercial satellites. Post-Challenger, it was deemed too risky to do so, and instead focused on scientific and military payloads. Afterward, NASA did occasionally launch some satellites, but mostly only for schools as a means to inspire people to the future. NASA might some day be able to take funds, but it isn't set up right now. And I don't think anyone would actually pay NASA to launch anything, it's costs are far higher than any rocket launch provider. The objectives of our space program are many and varied, but none of those objectives will ever lead to the kind of self-sustaining commercial ventures visualized in the popular speculation of the Golden Age. The Shuttle is a perfect example. Government cannot build a spaceship—at least not a very efficient one. The Shuttle as first designed was supposed to make access to space simple and cheap. Getting out of Earth’s gravity well and into LEO is the hardest part of space travel. That first step is a doozy, but once you’re in orbit, you’re halfway to anywhere in the Solar System. The Shuttle was supposed to do that for us. And even with 1970’s technology, the Shuttle could have made access to space relatively cheap and easy and a whole lot safer. Instead we got just exactly the opposite. Why? Because NASA engineers didn’t build the shuttle, Congress did. And the lawmakers on Capitol Hill don’t give a fart in a spacesuit about exploration. To them, the Shuttle meant, and still means, jobs and pork and votes. By the time Congress got done redesigning the Shuttle it was astounding that the damned thing could even clear the pad. Gone were the safety features like air-breathing engines that would have let the ship abort a landing and make a once around on final approach, gone was the piloted reusable main booster, gone was the simplicity that would have gotten rid of much of the previous Apollo infrastructure. Gone too was the once-a-week turnaround time from recovery to relaunch that would have made efficient use the economies-of-scale and reduced ground-to-orbit costs to dollars a pound instead of tens of thousands of dollars per pound. To this day parts are manufactured all across the country, many as far from the launch and assembly site as it is possible to get and still be on the same continent, because Senators and Representatives from powerful states like California insisted that it be so. The ship does nothing well, it’s too complicated and it requires far too much infrastructure, it’s a poor lift vehicle, it’s a poor science platform, it’s a poor crew vehicle and it falls short of the original design and concept in almost every way. Everybody got a piece of the Shuttle and as a result it shudders into orbit like Frankenstein’s Monster and the fact that it’s only blown up twice in 30 years is a minor miracle in itself. NASA isn't in business; it's a branch of government. Governments don't exist for the purpose of turning a profit like most corporations do. The primary goal of the Space Shuttle was cheap and reliable access to space. Unfortunately, for various reasons as covered in other answers, it failed to deliver on that promise. While the Shuttle was in service, other launchers were delivering commercial payloads to space because they were more cost-effective, capable, or available for the mission required. In other words, the Shuttle would have been incapable of delivering a profit from a commercial launch business because it would have been out-competed on price or unable to perform the mission required. However, the Shuttle did offer some unique capabilities, which made it the vehicle of choice for certain missions. For one thing, only the Shuttle could recover an object from orbit and bring it safely down to Earth - such as a faulty satellite or experiment package not designed/equipped to re-enter/touchdown/splashdown on its own. When you're the only option for a niche service where the job must get done, cost takes a back seat. But, with no charter to deliver a profit, you just charge out at cost anyway. The shuttle was conceived as a cost-effective launch vehicle, but by the time they actually had built one they could launch, it had been designed to do so many other things that it was no longer actually cost-effective. They stayed true to their original plans to sell satellite launch capability, however their costs were so high that this was an enormous money-loser for NASA. Worse, by charging low prices, they put would-be cheaper companies (such as Starstruck) out of business. Not the answer you're looking for? Browse other questions tagged launch artificial-satellite nasa space-shuttle or ask your own question. Why did NASA close the space shuttle program? Was a commercial (ad) balloon satellite ever deployed? 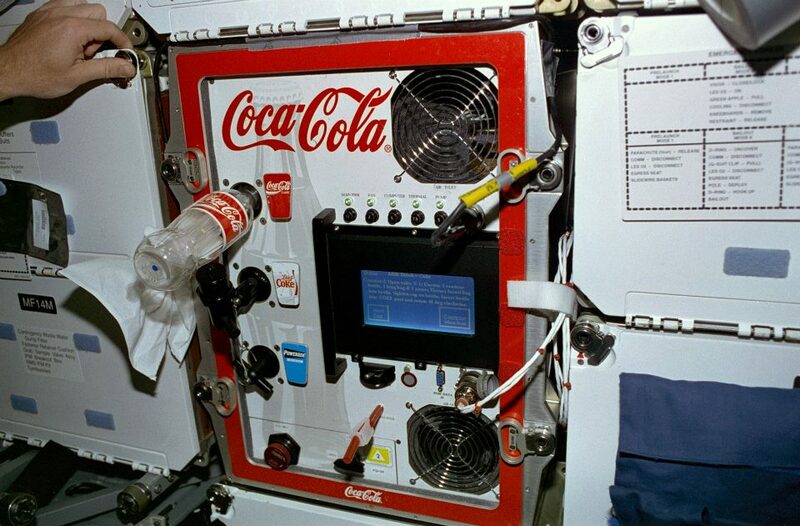 Can you enjoy a cold carbonated drink in space? What made NASA shut down the Shuttle program? Shuttle-C: Did we make the right move?